We began the lesson by discussing the definition of Bullying. Bullying is when someone hurts your body or feelings on purpose and it is happens over and over again. We then talked about 'the Bully Triangle.' I explained to them that we frequently think about bullying as involving two groups of people: the bully (or bullies), and the target (or targets). But most of the time, a third group of people are also present—the bystanders. 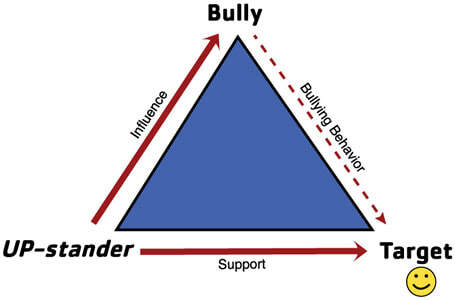 Bystanders are an important part of the “bully triangle” because most bullying takes place in front of peers—bullies generally like an audience, and bullying rarely happens when adults are watching.The key to stopping bully behaviors is to motivate and empower bystanders to take immediate positive actions to interrupt bullying, support the target and/or influence the bully to stop. If they do that, they become UP-standers . We then read the book "Say Something" and discussed who were the bystanders and Upstanders in the story. The lesson concluded with students sharing how they plan to stand up for their peers at Mason should they see someone being bullied. This week we began our lesson reviewing the definition of bullying, bystander, and upstander. We then moved into our lesson about conflict strategies. Students took turns pulling strategies from my "Conflict Tool Box" and we discussed each one. Students then were given scenarios to act out with a group using one of the conflict strategies discussed in the lesson. Today we talked about the importance of paying attention. Students learned that you have to pay attention with your eyes, ears, and body. We then did several activities that required students to pay attention in order to complete the tasks. We began this week's lesson talking about self esteem. I shared with students that it takes 5 positive comments to erase 1 negative comment about yourself. We read the book 'A New Improved Santa.' This story talks about how Santa does not like himself very much but realizes by the end of the story that he is perfect just the way he is. Students then learned about positive and negative self talk. We concluded the lesson with students writing positive comments about one another.